Tissot Time Rentals - T-Classic Tradition GMT.It seems that the warm weather has finally arrived. It seems that the warm weather has finally arrived. With the sun and warmer temperatures, also approaches the hour of departure. Distant destinations abroad or in our beautiful peninsula to relax. 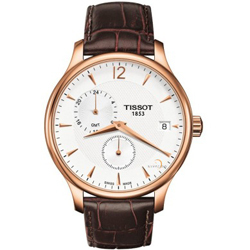 For lovers of travel and no, proposes Tissot T-Classic Tradition GMT. This model adds a vintage touch ultra modern watch making. The steel case and white dial, highlight the clean lines and essential combined with brown leather strap with butterfly clasp defines a sporty but elegant look. The code that identifies the two time zone “GMT” is an abbreviation for Greenwich Mean Time, which takes reference from the town of Greenwich, a suburb of London where, by international convention, originates with the prime meridian of 0 ° longitude. Essential feature for semplificarci things when we are on holiday abroad. Another new feature, we will soon see, with the return from holiday, is the variant with cash and close in Ref.T0636393603700 PVD Rose Gold. In addition to great aesthetic effect, the PVD is highly resistant and durable. With this procedure the clock is protected from wear, abrasion, from ‘sea water and sweat. The clock, with this process acquires brightness and hue homogeneous version PVD Rose Gold. Questo model, in particular, gives an elegant touch ultra modern watch making. The mechanism, three hands, or the sophisticated GMT chronograph perpetual calendar, reaffirm the continued research into innovative brand. The vintage classic details and finishes, blend perfectly with the high-tech operation, promising endless hours with a precision look simply fascinating.